This is another sleeper of the vintage from Hubert de Boüard. The 2006 reminds me somewhat of the 2001, perhaps not quite as lush at this state, but underrated as a vintage at this property. Dense purple, with sweet boysenberry, blueberry and black-raspberry fruit, licorice, chocolate and a touch of barbecue smoke, a bit of graphite also makes an appearance in this full-bodied, opulent wine that seems to be maturing much like the 2001. Drink it over the next 20-25 years.Drink 2015-2040. A spectacular effort (what’s new? ), this brilliant offering from proprietor Hubert de Bouard is another classic. A blend of 62% Merlot and 38% Cabernet Franc, it boasts an inky/purple color as well as a sumptuous bouquet of creosote, blueberry pie, espresso roast, blackberries, and graphite. Extremely full-bodied and stunningly rich with a multi-layered texture, sweet tannin, and a 45-second finish, this exceptional 2006 is one of the great wines of St.-Emilion. Anticipated maturity: 2012-2028. Tasted at Bordeaux Index's annual 10-Year On tasting in London. 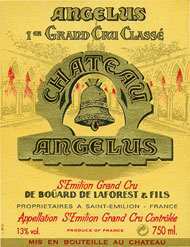 The 2006 Château Angelus, a blend of 47% Cabernet Franc, 50% Merlot and 3% Cabernet Sauvignon, has a very perfumed bouquet with scents of blueberry, cassis, crushed violets and just a touch of mushroom. This is very generous. The palate is medium-bodied with a smooth, slightly toasty entry. The acidity is quite low compared to other 2006 Saint Emilions, but there is harmony here and the tannins seem very fine. There is real density on the finish, although I was just seeking a little more delineation to come through. Give this another two or three years in bottle. Tasted January 2016.Drink 2018-2032. Tasted at the chateau. Four words: Wine of the Vintage. One punctuation mark and that is because we are assessing a pre-natal wine. But wow, it is all here. A deep black inky purple colour. Pure blackberry and blueberry on the nose, which has the precision and poise that most other Saint Emilion, could only dream about. In the background, a touch of blood orange and brown sugar. The palate is full-bodied, tannic but again with racy acidity and stupendous delineation a la Ausone. A touch of dark chocolate laces the crisp, sweet, blackberry and blueberry finish. Tasted within an hour of both Ausone and Cheval Blanc, Angelus slips past them both. Outstanding. Tasted April 2007. This has a gorgeous nose of black licorice, black cherry and sage. Full-bodied, with velvety tannins and a very long finish. There's beautiful texture for the vintage. Enjoy the fruit and richness. Best from 2013 through 2017. Full ruby. Vibrant aromas of crushed blueberry and bitter chocolate are further brightened by a violet quality. Dense, sweet and lush, with terrific depth and freshness to its dark fruit, mineral and violet flavors. This is really creamy-rich for the vintage. Finishes with smooth, chocolatey tannins and outstanding palate-saturating length. It's hard to imagine how Hubert de Bouard managed to get such a deep, layered middle palate without any sign of overextracted tannins or heaviness, but he has managed this neat trick.